We are up to the fourth round in the Cargo Crates, courtesy of a joint effort between Loot Crate and Quantum Mechanix, and this time, the theme is “A Leaf on the Wind”. If you couldn’t surmise by the theme name, that means a heavy emphasis on the best gorramn pilot in the galaxy, Hoban “Wash” Washburne. Let’s dive in. 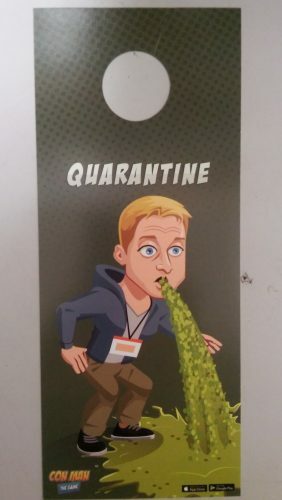 First up, the monthly sticker. Pretty self-explanatory here, so no real need to go into details. I honestly don’t know that I’ll ever use any of the stickers I get in these boxes, but they always look really nice, so that’s definitely a plus. 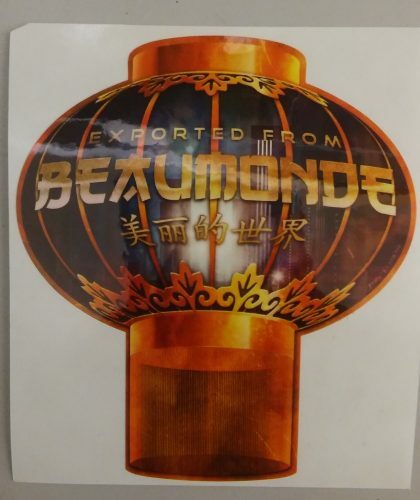 Good artwork and design. Up next, it looks like we’ve got a set of flash cards. 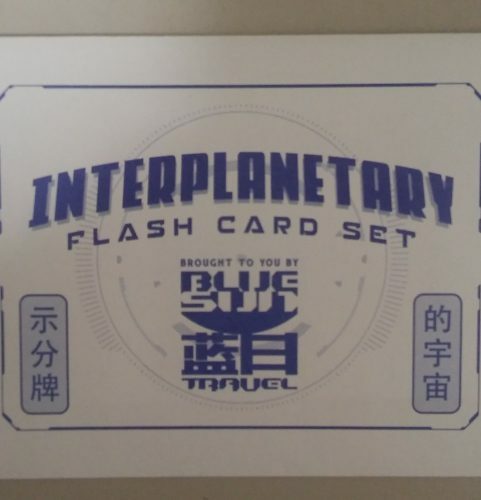 It’s a set of four, featuring planets from the Firefly/Serenity universe. 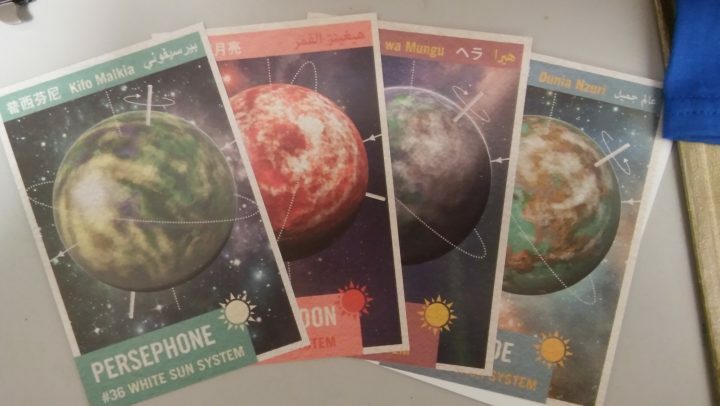 On the backs are facts and stats about each planet. Not a lot of use here, but they’re good for useless trivia/engaging in bar bets with your fellow Browncoats, if that’s your sort of thing. 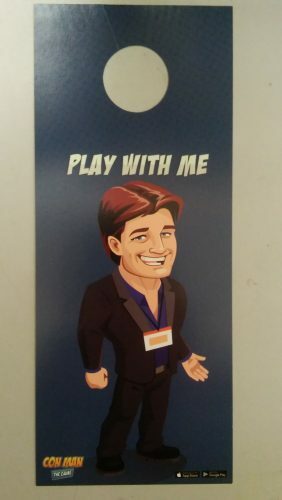 The third item is a door hanger, promoting the Con-Man mobile game, which is directly tied to the show of the same name created by Alan Tudyk and Nathan Fillion. 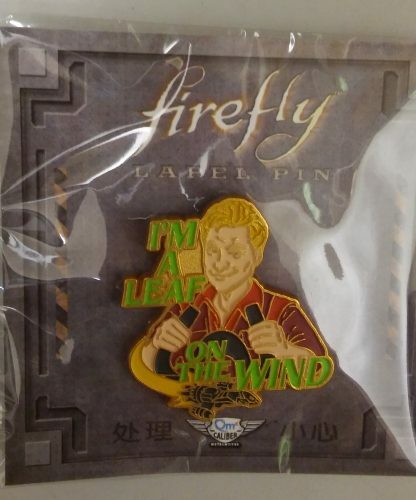 Although it’s not a Firefly item, there are enough references in it to the show (not to mention the presence of the show’s creators) that it makes perfect sense. I probably won’t get much use out of it, but if you’re a college student or someone with a roommate, it might come in handy were you to take your partner in a manly fashion. Now this item, I can definitely use. 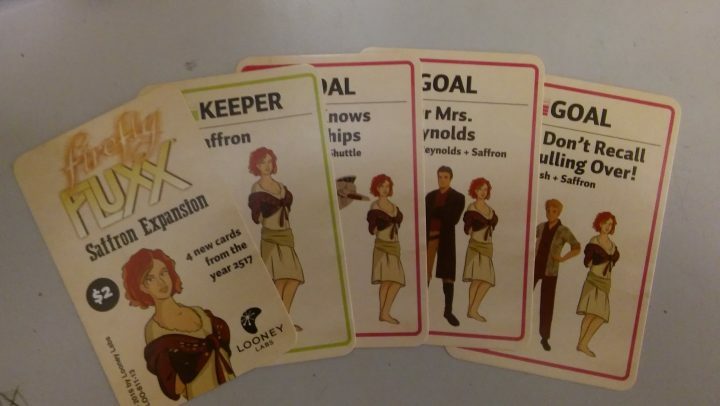 This is the Saffron Expansion for the Firefly Fluxx card game. If you’ve read my previous columns (and judging by the traffic, you haven’t), you know I’ve got the game and really enjoy it. While this pack is not any kind of a game changer, even mini-expansions have their purpose. In addition to the monthly sticker, there’s always a pin or two in these boxes. This one is no different. Quantum Mechanix makes the best lapel pins, and this will look great with the rest of the ones I’ve gotten through them. Sadly, it features Wash’s famous last words, a reminder of one of the worst movie deaths I have ever experienced. Still too soon, guys. A moment of silence, if you will. Okay, I’m back. Damn onions all over the place. Anyway, back to the contents of the box. Let’s move on to this month’s “Mini Masters” figure. Perfect. I love these figures, and this one is no different. Nice detail and colour, and with his ever-present dinosaurs to boot! Time to join his wife Zoë, Kaylee and Jayne on my desk at home. 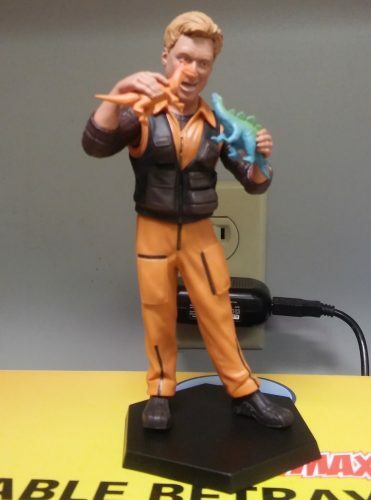 Unfortunately, this is the only regular figurine this month. 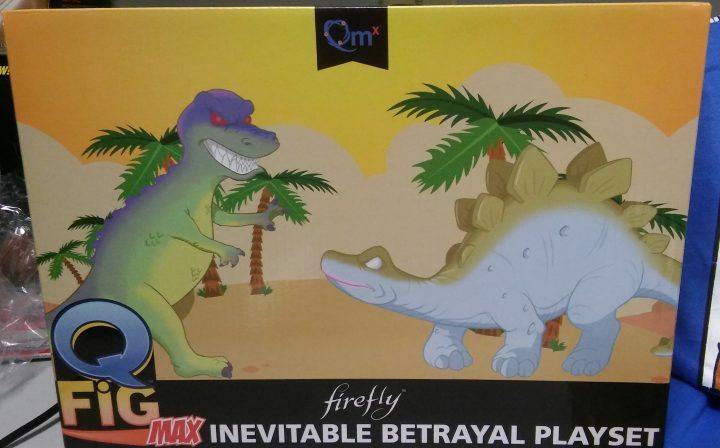 No blind-box Qbits figure, which is disappointing. However, I think the next item might be the reason why. My very own set of dinosaurs! Woo! Alright, let’s take a look inside the box. Finally, I can create one of my favourite Wash scenes from the show! I mean, if I was into doing that sort of thing. Which I’m totally not. Until now. 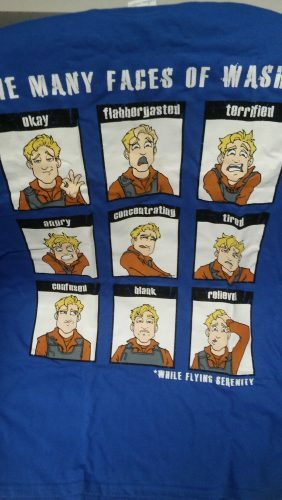 Lastly, the monthly t-shirt, “The Many Faces of Wash* (*While Flying Serenity)”. Hmmm…yep, those seem about right. I was expecting another shirt based on one worn on the show (or in a similar style), but I appreciate funny designs as much as the next person, so this has my approval. Also, it’s on a colour other than black, so it gets some extra credit for that. Well, this wasn’t my favourite Cargo Crate thus far, but I’m still not going to complain. There’s more than enough fun stuff in here to make it worthwhile, and that’s what matters. Well, that’s all for this time around. Next time, the theme will be “Serenity”, so that should make for a good selection. Keep flying!